With Summer fast approaching (yay!) it’s only natural that we all start to panic a little, 'I haven’t done any exercise for months, I shouldn’t have eaten that third muffin, I can’t find my trainers' and so on.... well panic not because here are some tips for getting fit and healthy with your dog. 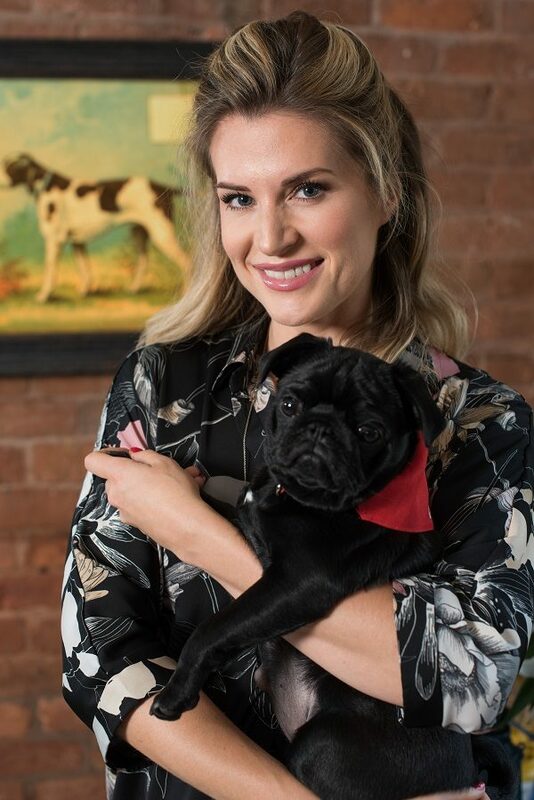 That’s right, having a lovable canine friend can help motivate you and banish those excuses for not doing any exercise, says actress, personal fitness instructor and new K9 Magazine columnist, Sarah Jayne Dunn. Anyone with a dog will have undoubtedly found themselves wrapped up in the deepest, darkest Winter months, out walking in all weather conditions to give our dogs some exercise, fresh air, toilet time and release from the boredom of the same four walls. This just shows our love and dedication to our four-legged friends, but it can also work to help improve your health. Firstly, just being out in the fresh air can make a massive difference to your day and your health. Admit it, even when you’ve been out in the worst weather conditions and come home looking like you’ve been through your local car wash before giving yourself a mud bath, there’s something really satisfying about getting back home into your warm (and dry) surroundings knowing that you and your dog have had a little exercise. Just 30 minutes of brisk walking a day can vastly improve both your own and your dog’s health both physically and mentally. But why stop there? By adding just a bit of imagination and fun to your daily walk, you can tick off your exercise quota without even realising you’ve broken a sweat and your pooch will thank you for that extra time outside too. The first is simple, just get outside. Take that step to get up off the sofa and out through the door. Even a 20 minute brisk walk with your dog is better than none. Increase the time of your walk, daily. If you’re new to exercise then build up slowly, start with a 20 minute walk, then increase this to 25 minutes and so on. Make this more exciting by varying the route you walk or give yourself a time frame to cover a certain part of the journey, to make you work harder and get your heart rate up. If you have a dog that enjoys a run and has lots of energy, then why not increase your walking pace to a jog or even a run. Set yourself a time or certain distance/route to run and let your pooch enjoy it with you. A great way to incorporate exercise into a fun game with your dog is to find a safe area of green to play in and take your dog’s favourite toy. Whether it be a ball, frisbee or some other type of toy, throw your pet’s chosen play thing and as your dog runs after it, so do you! Try to beat your dog to the toy, retrieve it, throw it again and run again! This is called interval training, short bursts of high-intensity exercise, great for increasing your fitness levels and awesome for burning fat, win win! Another way to incorporate interval training into your dog walking is to alternate between a steady paced walk with a flat out run (as fast as you can). A good way to do this is to pick markers along your route as you go and walk between one, sprint to the next, for example; start to walk briskly at the park bench until you reach the dustbin, then run as fast as you can until you reach the lamp post, slow down to a walk again to let your heart rate come back down until you reach the next park bench and so on. Play fetch with your dog, each time he/she runs to fetch the ball you can do an exercise until your dog returns. Try these exercises and mix them up - jumping jacks, squats, mountain climbers, sit ups, press ups, tricep dips (use a park bench), lunges, side lunges, plank. Choose more challenging walking routes. Don’t let your walk become routine, this can easily get boring and it can be hard to motivate yourself to get outside if you know just what to expect. Look on your local community website and find some interesting walks, these will challenge both the body and mind. Rope in a friend and their dog for company! Exercise on your own can get monotonous and boring, by inviting a friend along you can motivate each other and your dogs can have fun playing together. Make a weekly date in the diary. This will encourage you to make sure you both commit to a least one day of exercise, increase this if you can and try to set each other challenges for each walk. Get out in the park and play chase with your dog. It sounds silly but this simple game will please your dog no end and will challenge your body’s coordination skills as you chase your furry friend around the park. Stay hydrated, always make sure you carry plenty of fresh drinking water for you and your dog. The body needs to stay well hydrated at all times, especially when being exerted to the max! Get away. Plan a night or weekend away with your pooch and incorporate seeing a new place whilst getting fit and healthy. Myself, my pug Ming Ming alongside our master Jon, love to visit new places. We recently stayed at The Feversham Arms Hotel in Yorkshire. A lovely pet friendly hotel with lots of wonderful, country walks on the doorstep, lots of hills to walk up, great to work those leg muscles. Make it a social occasion. Find your favourite dog friendly local and arrange to meet your friends and their dogs for lunch, just make sure that you make healthy food choices, 90% of your body’s health is down to diet, don’t ruin all your hard work by making a bad food choice. Nourish your body instead with a healthy delicious lunch and rehydrate with water. Make sure you walk to and from your lunch date too to get in your exercise for the day! Mine, Jon & Ming Ming’s favourite dog friendly lunch spots are Neighbourhood in Woolton, Liverpool & The Egerton Arms Pub in Chelford, Cheshire. Make sure you and your dog are kitted out properly for your activities. Wear appropriate footwear, for example, trainers and bright, highly visible clothing if out when dark and make sure your dog has a sturdy collar and lead you can trust. You want to be confident that it's secure while you're walking and running. Ming Ming and I love the latest Spring colours (also nice and bright) from My McDawg. Her matching set is really beautiful and very high quality with webbing sewn into the middle of the collar for extra strength. Ming Ming also really loves the moleskin for the lining which has a lovely soft velvety feel for comfort. Take lovely yummy treats for your dog to reward them for their good behaviour whilst you’re out. Ming Ming loves Pet Munchies treats, particularly the training treats while out and about. Most of all have fun. Enjoy the time you are spending in the fresh air with your best pal and think of all the wonderful things that it’s doing to your precious, incredible body. Be proud of the effort you are making and don’t punish yourself if you don’t do as much as you’d hoped. Progress slowly but positively and you and your pet will both see and feel the benefits that just a few hours of exercise a week and a healthy diet can have on your mind and body. Well, we're feeling inspired! Has Sarah inspired you too? Share your own tips with us by commenting below, we love hearing from you! Never one to let the grass grow too long under her feet, as well as being a fully qualified personal trainer, Sarah is also a qualified make up artist, including HD Brows.